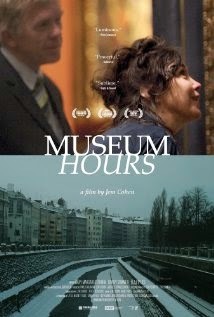 Museum Hours is a unique film, that almost feels more like a documentary. A meandering attempt to capture life, friendship and art. As such it won't be for everyone. It is a slow moving film, with not much in the way of a story and certainly no conflict. The two main characters are hardly the subject matter. However their new found friendship is a refreshingly honest portrayal of people. People from different places meeting, and talking about anything and everything the way real people do, and finding things in common. Anne (Mary Margaret O'Hara) is in Austria to visit her comatose cousin, Janet, in the hospital. She explains that they are about all that's left of the family, so it had to be Anne to visit her in the hospital. Johann (Bobby Sommer) is a security guard at the Kunsthistorisches Museum in Vienna. He explains briefly his job history and how he came to work at the museum. Shortly thereafter, Anne shows up at the museum. She goes to Johann for help with directions to the hospital, and she keeps coming back. Johann compassionately helps her over and over again, knowing that if he were stuck in a foreign city, he'd hope someone would do the same for him. He takes Anne around and shows her places he likes. They're travelling and getting a sense of the city in a more genuine sense. Not touristy places, but interesting places nonetheless. Seeing them again makes him realize how much he likes them. He explains in another voice over, that it had been a long time since he had been to these places, or gone simply for the sake of showing them to someone. It also make him realize how much time he spends sitting at home on the internet. This film wants us to think. It wants us to examine art, and not just museum art, but the art happening all around us. It was us to realize we've become a generation addicted to the internet and computer screens often missing life all around us. We have so many distractions, that it's easy to miss the beauty around us. It's possible to go to Google Earth and view a virtual tour of the Kunsthistorisches Museum, but that is nothing compared to being there in person. Cohen seems to beg us to slow down, put away our devices once in a while, and observe. There is beautiful art, and stories unfolding all around us if only we'd pay attention to them. Cohen also show us the lack of respect for art in the younger generations. Johann observes a class of students visiting the museum. He mentions that most of them try to ignore the teacher, and send text messages instead of looking at the painting. He notices them making jokes to each other. Their interest is only piqued when they come to paintings of beheadings and naked breasts. Johann is perhaps a bit annoyed with them, but mentions that he'd probably have been the same way if he were their age. Director Jem Cohen, doesn't just mean for us to enjoy art, but to observe people. Much of the art is about people, and Cohen gives shot after shot of people going about their daily lives. More so, he gives us two characters who become friends with nothing more or deeper to their connection, just simple friendship. They spend time together, going to cafes and just chatting about anything and everything. Johann and Anne chat as if they're telling their own real stories. These non-actors somehow feel so natural, that it seems as if they aren't working from a script, but sharing themselves with each other. The film has a lot to say about art and life, and for the most part it doesn't do so in a didactic way. Except for one scene that goes a little too long. A guest lecturer comes to the museum. She tells a tour group about Breugel's art. He was known for capturing, "quaint scenes of peasant life." Much the way Cohen here attempts to capture quaint scenes of life around Vienna. He's trying to show everyday reality, or the human condition in a certain place at a certain time. Cohen's shots around the city show the art all around us: a sign, a clock, architecture, graffiti on a wall. The people who live there walk around and pay no attention to any of the detail, not the way a visitor to a museum peers into a painting. Then, as if reading my mind, Johann turns to the subject of worth. He explains that there is likely no art in the museum he'd describe as priceless. Nothing that is so valuable that no price could be put on it. He explains that many paintings were worthless in their day, and the painters died poor. Only now are they considered to be of value. These paintings hang in museums next to other paintings that sold for vast sums of money, but looking at them side by side, no one would know which was the expensive one and which the cheap one. Art in its many various forms is like that. Cohen finishes his film by observing a group of people, including his two main characters interacting, singing, dancing, drinking, and enjoying each others company. It's a picture of life; observing the human condition. He then cuts to a series of shots, simple camera setups viewing a street or walkway in the city. Johann provides a voice over, describing the scene much the way a museum tour guide explains a painting to us. Cohen dedicated the film to his parents, who took him to museums. 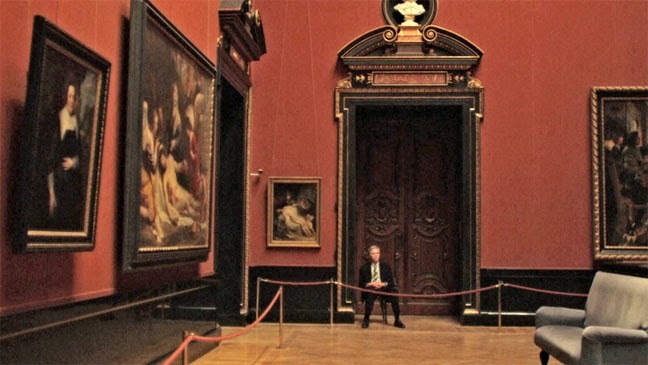 He wants to remind society why museums are important. And how art can influence our outward view of the world around us. Museum Hours is an interesting piece of art about art. It is meant to be looked at closely, to enjoy it's finer details. It inspires us to put down our devices and pay attention to art. Thinking of it in that mindset, it's easy to overlook its lack of story, and instead embrace it for what it is, while embracing a new found interest in art, both found in museums, and all around us.